‘Photoaging’ is a fancy way of saying aging due to sun damage. Each day, we are exposed to harmful rays (UVA and UVB) that cause damage to our skin, both cosmetic and serious. Those of us who grew up in the 70s used baby oil to fry our skin to a crispy golden colour. Smarter today, we are now left to deal with the damage caused. I have used sunscreen on my face for the past 20 years, so at least I haven’t been adding to the problem. 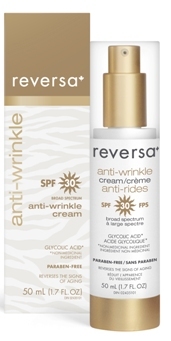 When I received a bottle of Reversa Anti-Wrinkle Cream SPF 30, I had to give it a try. Reversa uses 8% glycolic acid to repair photodamage, and a full spectrum UVA/UVB SPF 30 to prevent further damage. This unique combination means that you can repair and protect your skin with a single product. I have never used AHAs before, so I wasn’t sure what to expect. I hoped it wouldn’t feel harsh, and in my experience, it doesn’t. Reversa feels rich and absorbs quickly. I use two pumps’ worth of product, making sure to cover my face and neck. Reversa contains 0% paraben, oil, volatile silicone and perfume, and is suitable for all skin types. A 50 ml bottle – available at Canadian drugstores – retails for $45, a bargain by most anti-aging cream standards.